A prosthesis is a replacement for a missing body part, such as a tooth. Pre-prosthetic surgery is the preparation of the soft and bony structures in the mouth for dentures, or replacement teeth. There are several anesthetic options when receiving pre-prosthetic surgery, including local anesthesia, intravenous (IV) sedation, and Nitrous Oxide Gas (laughing gas). Your doctor will discuss with you the best anesthetic option for your treatment. For many patients, dental implants are a better solution for tooth replacement. 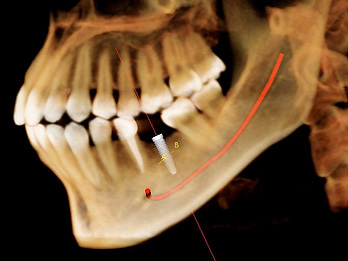 See the “Dental Implants” link in the left column for more information. When preparing the mouth for dental implants, occasionally there is a need to move the nerve which gives feeling to the lower lip and chin (inferior alveolar nerve). It is a procedure considered to be an aggressive approach, and other options are considered before deciding to proceed with nerve repositioning. This is because there is almost always some postoperative numbness of the lower lip and jaw, which dissipates very slowly, if ever. However, the procedure does allow for the placement of longer implants, thereby improving implant longevity. It can also be used to preserve the alveolar nerve during resection of benign tumors or cysts. During the procedure, the doctor will remove an outer section of the cheek side of the lower jawbone. The nerve and vessel canal is exposed, allowing it to be pulled slightly out to the side. When the implants are placed, this neuro-vascular bundle is carefully maintained in position, then released and placed over the implants. Open areas are filled with bone graft material, and the site is then closed. Your doctor will discuss the most appropriate type of anesthesia, but typically this procedure is performed in the office surgery under Intravenous (IV) sedation or general anesthesia.